United Colors of Benetton has been a classic standby for chic wardrobe staples for years, but now they're giving their stores a facelift — and they're starting with Chicago. You may have noticed the flagship on Michigan Avenue has been out of commission for some time, but it's now poised for the grand unveiling next weekend. And, we've got an inside peek at renderings of the brand-new boutique. The interiors, designed by Italian star architect Piero Lissoni, will feature all-knit furniture (think couches and ottomans decked out like Fair Isle sweaters), and awesome accents like rolling suitcases filled with fall fashions. 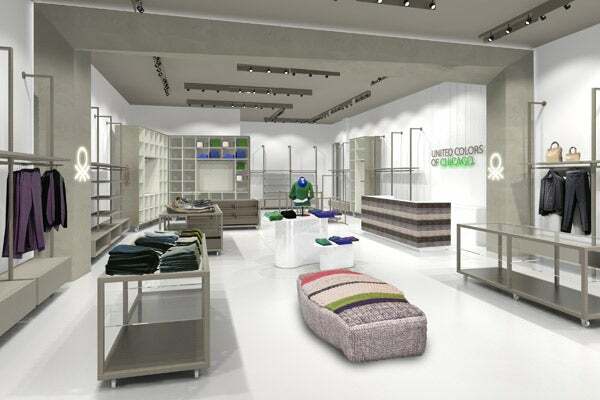 If you like what you see, get excited — Chicago's debut is just the beginning of a complete design overhaul in all Benetton stores nationwide. Mark your calendars for Saturday, August 4, and get ready to rediscover your love for this iconic brand. United Colors of Benetton, 520 North Michigan Avenue (between Ohio Street and Grand Avenue).